Included in this beautiful clear presentation carry box are four Nicholson Fine Food Medal or Champion products. This is a sensational gift for any person who loves fine artisan food with a little bit of spice!. See recipe videos for an interesting and fun recipe for your Belgian Chocolate White Mousse as a ricotta filling for cannoli. Category: Value Gift Hampers. 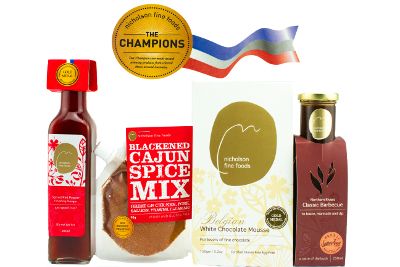 Tags: and, BBQ, Belgian, Blackened, Cajun, Chocolate, delicious, dressing, Essence, Finishing, food, Gift, Hamper, Mousse, Northern, Pepper, Red, Rivers, sauce, Spice, Vinegar, Vinegars.